Security forces demolished the Lazar family's new home, days before it was to move in. 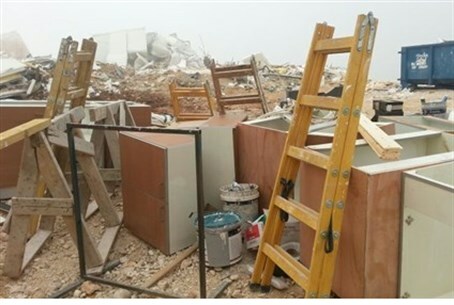 Israeli security forces demolished a new home that a family was about to move into before dawn Wednesday, in the community of Yitzhar in Samaria. The forces arrived at Givat Hatekuma (Hill 725) in Yitzhar and tore down a house that was built by the Lazar family – Avi, Shoshana and their five children – who were about to move into the home on Sunday. Residents of Yitzhar said that they do not remember witnessing such a scene of devastation in their community in recent years. The house stood on an area of 125 square meters and was worth about 500,000 shekels, or $140,000. The residents said that the land the home was built on so-called "survey land," which would have become state land in a matter of a few years, and was carried out "for no reason." One of the residents of Kipa Sruga Hill was said to have been beaten and handcuffed during the demolition and later released. The demolition in Yitzhar comes on the heels of the destruction of the Kaisler family's new home in Kida, Samaria, in early February. That move was seen by many as an act of political vengeance by the Civil Administration against Sagi Kaisler, the director of the Shomron (Samaria) Residents' Committee.